Classic air-cooled 911s are more popular (and expensive) than ever. Singer Vehicle Design isn’t the only game in town (well, Los Angeles, specifically) when it comes to restoring and augmenting classic air-cooled Porsche 911s. Marlon Goldberg, who was recently invited to Jay Leno’s Garage, is a former Singer employee who’s gone off on his own to start his own classic 911 resto shop. But unlike Singer, Goldberg’s LA Workshop 5001 focuses on early 1970s 911s, instead of the later 964 generation which is Singer’s area of expertise. Though they’re both classic-bodied 911s, we’re talking about two different generations, each with their own unique flavors and, of course, buyers. Goldberg brought two of his completed customer car 911s to Leno’s place, a 1973 911T and a 1974 911, the latter now being more of a hot road. 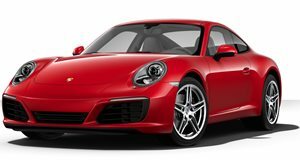 The 911T, however, is Goldberg’s preferred choice to drive, mainly because of its daily driving character whereas the ’74 911 is for the track, although it’s also street legal. Of course Leno opts for the latter. Instead of its original 2.7-liter flat-six, the client went with a bored-out 3.8-liter flat-six from a 964, tuned to 350 hp. With its stripped-out interior, meaning there’s pretty much only a couple of bucket seats and a roll cage, this ’74 911 has been given a new lease on life, thanks to its builders having the skills and knowledge to exploit its best traits and build upon them. And like Singer, everything here looks to be of the highest quality. Check out this latest episode and we’re sure you’ll dig what LA Workshop 5001 is all about.